When introducing basic flight maneuvers to a beginning pilot, it is recommended that the “Integrated” or “Composite” method of flight instruction be used. This means the use of outside references and flight instruments to establish and maintain desired flight attitudes and airplane performance. [Figure 3-5] When beginning pilots use this technique, they achieve a more precise and competent overall piloting ability. Although this method of airplane control may become second nature with experience, the beginning pilot must make a determined effort to master the technique. The pilot visually controls the airplane’s attitude in reference outside to the natural horizon. At least 90 percent of the pilot’s attention should be devoted to outside visual references and scanning for airborne traffic. The process of visually evaluating pitch and bank attitude is nearly an imperceptible continuous stream of attitude information. If the attitude is found to be other than desired, the pilot should make precise, smooth, and accurate flight control corrections to return the airplane to the desired attitude. Continuous visual checks of the outside references and immediate corrections made by the pilot minimize the chance for the airplane to deviate from the desired heading, altitude, and flightpath. The airplane’s attitude is validated by referring to flight instruments and confirming performance. If the flight instruments display that the airplane’s performance is in need of correction, the required correction must be determined and then precisely, smoothly, and accurately applied with reference to the natural horizon. The airplane’s attitude and performance are then rechecked by referring to flight instruments. The pilot then maintains the corrected attitude by reference to the natural horizon. The pilot should monitor the airplane’s performance by making quick snap-shots of the flight instruments. 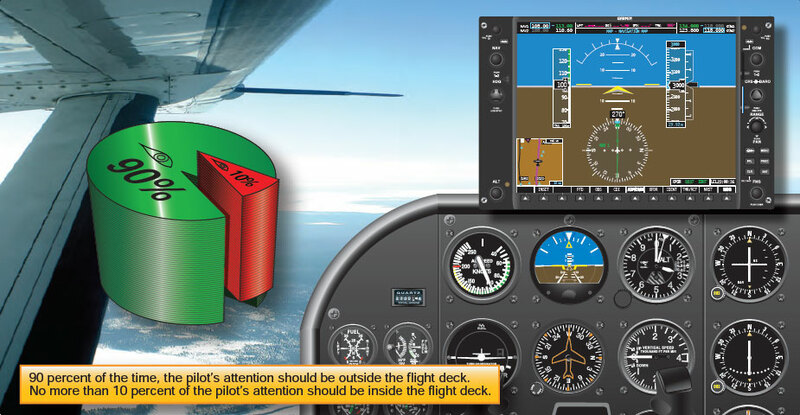 No more than 10 percent of the pilot’s attention should be inside the cockpit. The pilot must develop the skill to quickly focus on the appropriate flight instruments and then immediately return to the visual outside references to control the airplane’s attitude. The pilot should become familiar with the relationship between outside visual references to the natural horizon and the corresponding flight instrument indications. For example, a pitch attitude adjustment may require a movement of the pilot’s reference point of several inches in relation to the natural horizon but correspond to a seemingly insignificant movement of the reference bar on the airplane’s attitude indicator. Similarly, a deviation from a desired bank angle, which is obvious when referencing the airplane’s wingtips or cowling relative to the natural horizon, may be imperceptible on the airplane’s attitude indicator to the beginner pilot. The most common error made by the beginner pilot is to make pitch or bank corrections while still looking inside the cockpit. It is also common for beginner pilots to fixate on the flight instruments—a conscious effort is required by them to return to outside visual references. For the first several hours of instruction, flight instructors may choose to use flight instrument covers to develop a beginning pilot’s skill or to correct a pilot’s poor habit of fixating on instruments by forcing them to use outside visual references for aircraft control. The use of integrated flight instruction does not, and is not intended to prepare pilots for flight in instrument weather conditions. The most common error made by the beginning student is to make pitch or bank corrections while still looking inside the cockpit. Control pressure is applied, but the beginning pilot, not being familiar with the intricacies of flight by references to instruments, including such things as instrument lag and gyroscopic precession, will invariably make excessive attitude corrections and end up “chasing the instruments.” Airplane attitude by reference to the natural horizon, however, is immediate in its indications, accurate, and presented many times larger than any instrument could be. Also, the beginning pilot must be made aware that anytime, for whatever reason, airplane attitude by reference to the natural horizon cannot be established and/or maintained, the situation should be considered a bona fide emergency.